Pakistan Telecommunication Limited (PTCL) is playing unique and kind of new activities with their customers to attract them more for the landline phone usage. Since the boom of the mobile phone industry in the country people have started shifting to mobile networks and the usage of landline number is reducing by a great number. PTCL has now introduced a new attractive thing for their customers, but they are selling it on a huge price. PTCL Premium Platinum and Golden landline numbers. Yes! PTCL is now selling golden and platinum numbers to their customers and the most amazing and shocking part for me was the price of those numbers in addition to a strange terms and conditions. The customer cannot suggest a number, rather PTCL is allot the number by them-self. See, you are laughing too, and now when I’ll tell you the price of the premium numbers you will fall on the floor laughing. Ha Ha Ha! Yes, You will pay Rs.15,000 for a number and still you cannot select your own number. 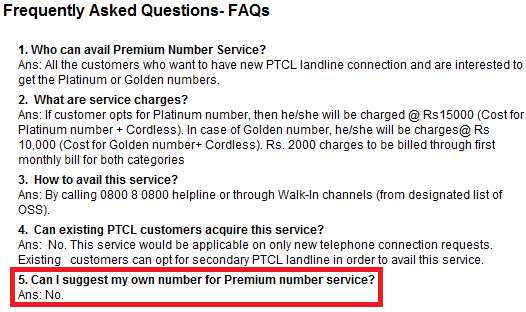 Seriously, I’m not kidding you can view the PTCL Premium Number Website which gives the FAQ’s and see the question number 5 (screenshot is attached below). And to attract the customers they are giving a free cordless telephone set with the number. The price of the premium number mentioned about includes the free cordless telephone set. I wonder what kind of attraction that is. A cordless phone and a number for Rs.15k. Yes! and not to forget, beside paying the fees of the premium number, you still have to pay the PTCL connection fees of Rs.2000 which will be added to your first month’s bill. What I think about this new campaign by PTCL is that they have thought quite a great thing to start giving customers a golden or platinum number, but the cost of the number is way too much. We live in Pakistan and the average income of an individual living in Pakistan is still not Rs.10,000 per month. How would people afford such numbers? Rather looking at just 0.1% of the rich population of Pakistan, PTCL should concentrate on the rest of 99.9% of the common Pakistan’s population.